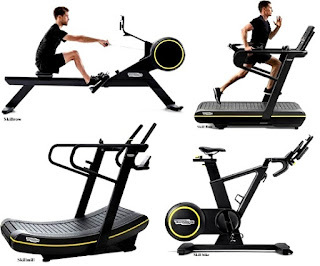 Inspired by athletes, Technogym – the leading producer of design and technology-driven fitness equipment and solutions – is proud to announce the launch of non motorized series of wellness equipments like SKILLMILL, SKILLRUN, SKILLROW and SKILLBIKE, combines Power, Speed, Stamina and Agility training, aerobic capacity, neuromuscular abilities in a single solution. As Official supplier to 7 Olympic Games and partner to the world’s best performing teams and athletes, Technogym has a first-hand experience in the training methods and systems of thousands of worldwide sports champions in over 100 different disciplines. This know-how is at the heart of Athletic Performance Training, a new methodology that helps to create high intensity workouts aimed to improve sports performance. 1. SKILLMILL - Benefiting the user by increasing their metabolic rate and encouraging maximum muscle activation, this groundbreaking and highly effective piece of equipment is capable of training all the body’s energy systems in a single solution. The SKILLMILL is a new breed of treadmill which is non motorized, operated and controlled by the force applied exclusively by its users. To speed up, they move to the front of the surface and to slow down, they move to the back. It accelerates quickly from a cold start and goes the same pace athletes go. SKILLMILL is also ideal for athletic training inspired classes or small group sessions. It offers a range of connectivity options to maximize performance and results in full safety. SKILLMILL is fully integrated within mywellness, the Technogym cloud based training platform. Users can access training programs by scanning Skillmill QR code or by downloading the mywellness app, can monitor training parameters in real time from the on-board console. Alongside the possibility to follow the programs specifically designed, SKILLMILL is ideal for athletic training inspired classes or small group sessions. 2. SKILLRUN - shatters all expectations of what a treadmill can be. It is the first piece of running equipment designed to meet the training requirements of elite athletes and demanding fitness enthusiasts. Its unique Multidrive Technology™, SKILLRUN users can combine cardio and power training in a single solution. MULTIDRIVE TECHNOLOGY SKILLRUN™ creates the new gold standard for performance running, answering the needs of all runners, from sprinters to marathoners and triathletes. The innovative MULTIDRIVE TECHNOLOGY™ (PATENT PENDING) enables users to perform running sessions and resistance workouts on the same piece of equipment, providing a well-rounded cardio and power training workout. SPEED - Strengthen your resistive power and top-end speed with PARACHUTE TRAINING. The exclusive Technogym workout and optional PARACHUTE TRAINING KIT (PATENT PENDING) reproduce the feeling of outdoor running with a parachute in optimized conditions. Resistance is null at the start and increases as you gain speed. PARACHUTE TRAINING is ideal for speed resistance training workouts. POWER - Boost your explosive power and acceleration with SLED TRAINING. The exclusive Technogym workout reproduces the feeling of pushing a sled on grass. Resistance is high at the start and decreases to a constant rate as you pick up speed. SLED TRAINING is ideal for pushing against resistance workouts. AGILITY - Improve your neuromuscular coordination with agility drills and CADENCE TRAINING. The wider running space enables you to perform multidirectional exercises and cadence variations in total safety and comfort. STAMINA - Raise your endurance efficiency with BIOFEEDBACK (PATENT PENDING). The exclusive interactive technology by Technogym tracks and monitors your main running parameters in real time, providing colour-coded feedback that enables you to improve your performance. 3. SKILLROW has been designed to provide an unparalleled feeling simulating the rowing on water called AQUAFEEL.SKILLOW’S resistance follows the natural curve of the stroke in the water and thanks to AQUAFEEL, the resistance is gradual, making the movement fluid throughout and avoiding the backlash effect on the lower back. MULTIDRIVE Technology - The MULTIDRIVE technology (patent pending) enables users to add a further resistance to the air resistance. This groundbreaking innovation makes it possible for users to change the equipment mode from cardiovascular training to power training by simply adjusting the resistance level. By setting the resistance at low, medium or high, users can perform the rowing movement with additional load or to execute power exercises. Moreover, the MULTIDRIVE TECHNOLOGY makes it safe to perform triple extensions (targeting hips, knees and ankles) with explosive forceful movements as in the push off phase during jumping and sprinting. INTERACTIVE TRAINING - SKILLROW APP users can enjoy a more motivating digital experience and have a virtual cox always available. The app includes a variety of training programs and tools to offer users training guidance which are part of the TNT - Technogym Neuromuscular training system. The technology will also enable users to monitor and track their results, and to get real time bio-feedback on the training metrics to improve their performance, and to challenge their friends. SKILLROW is ideal for athletic training inspired classes, group sessions and athletic performance circuits. In a group class SKILLROW offers users the chance to row together in total synchronicity as a real crew, a true engaging experience where they can both receive individual feedback on their own performance or compete with each other thanks to the real time display of training data on a large screen. 4. SKILLBIKE includes exclusive features specifically designed for athletic and performance training: it is the first indoor bike with real gear. The REAL GEAR SHIFT patent that allows users to replicate the dynamics of hill riding. By shifting gears, riders can counter the change in resistance and maintain the correct power and cadence for the maximum efficiency, while the console displays the gear ratio selections in real time. Real Gear Shift enables the unique MULTIDRIVE TECHNOLOGYTM (patent pending) that allows riders to switch from power based trainingroutines to hill climbing simulations. This improves strength and endurance as well as maximizing efficiency in a new and engaging way. To offer the same feeling of outdoor riding, SKILLBIKE’s RIDING DESIGN (Patent) reproduces the biomechanics of outdoor bikes. The frame and handlebar are shaped to seamlessly accommodate different riding positions such as road, time trial and mountain bike. At the heart of SKILLBIKE™ is the ingenious ROADEFFECT system which simulates the feeling of riding outdoor by reading your pedaling style and performance parameters. SKILLBIKE is a digital and fully interactive product: the integrated 7” colour LED connected console provides all of the relevant data of your performance with real-time feedback on cadence, watts, speed, distance, gradient, heart rate, selected gear and gear ratio. Thanks to its PEDAL PRINTING™ technology, SKILLBIKE also offers feedback on the circularity and symmetry of your pedaling at different gear ratios to monitor and increase your efficiency.